Join the Linkedin group on Residue Networks in Structural Biology! A new version of RINalyzer for Cytoscape 3.x is released. RINalyzer has been greatly extended with new functionality and is now using the structureViz2 app to interact with UCSF Chimera. For a brief introduction of the new features click here. The RINalyzer app is now available for download here and the structureViz app here. All requirements and installation instructions are available here. A new version of RINerator is released. In particular, it computes conservation scores from a user-specified multiple sequence alignment, retrieves biochemical amino acid properties from external resources, and generates RINs compatible with Cytoscape 3.x and RINalyzer 2.x. For more information, see the RINerator webpage. 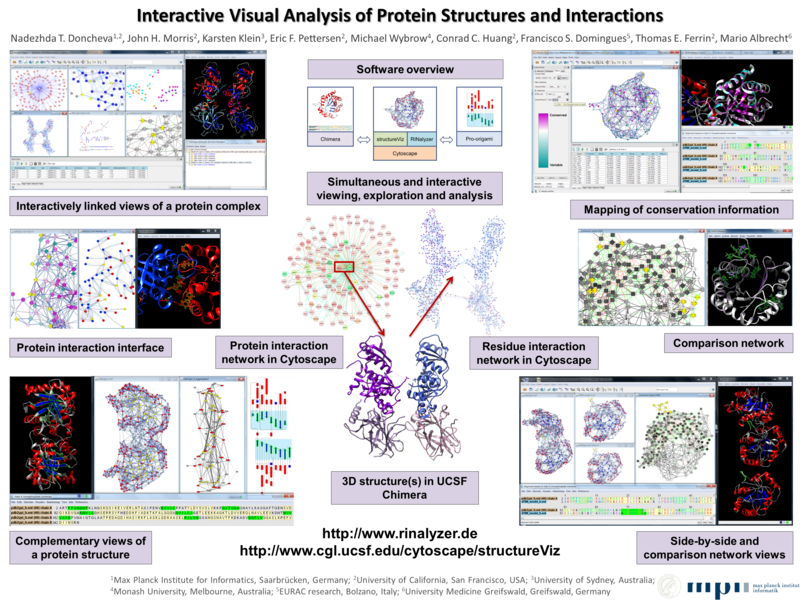 Our poster at VIZBI 2014 (abstract available here). RINalyzer provides a number of important methods for analyzing and visualizing residue interaction networks (RINs). A RIN is constructed from the three-dimensional structure of a protein as stored in PDB files from the Protein Data Bank. Network nodes and edges represent amino acid residues and their molecular interactions, respectively. The network topology of RINs is normally characterized by undirected and weighted interaction edges between residue nodes. RINalyzer is a Java plugin for Cytoscape, a free software platform for the analysis and visualization of molecular interaction networks. RINalyzer allows simultaneous, interactive 2D visualization and exploration of a RIN in Cytoscape, together with the corresponding molecular 3D structure visualized in UCSF Chimera. Furthermore, RINalyzer offers the computation and illustration of a comprehensive set of weighted centrality measures for relating spatially distant residue nodes and discovering critical residues and their long-range interaction paths in protein structures. Another feature is the network comparison of aligned protein structures by constructing a combined RIN, which enables the detailed comparative analysis of residue interactions in different proteins. In addition, RINalyzer supports the interactive exploration by providing easy-to-use filters and the generation of subnetworks and aggregated networks. A list of all main features of RINalyzer as well as an overview screenshot can be found here. RINalyzer is complemented by the RINerator module, which generates user-defined RINs from a 3D protein structure. In contrast to previous simplistic interaction definition approaches based on spatial atomic distance between residues, RINerator enables a more realistic representation by considering different biochemical interaction types and even quantifying the strength of individual interactions. Since version 2.0 RINalyzer is using the structureViz2 app to interact with UCSF Chimera and both apps complement each other. A detailed documentation as well as storage and format specifications can be found here. A tutorial for the first steps of using RINalyzer is available here. Further information and tutorials on using Cytoscape are available here. Trends in Biochemical Sciences, 36(4):179-182, doi:10.1016/j.tibs.2011.01.002. 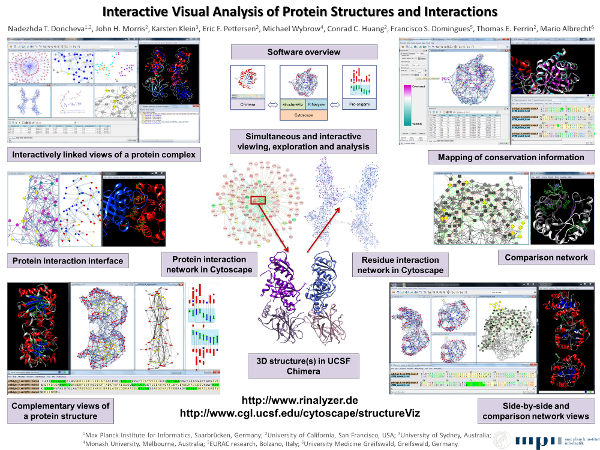 Integrative visual analysis of protein sequence mutations. BMC Proceedings, 8(Suppl 2):S2, doi:10.1186/1753-6561-8-S2-S2. You can download the latest release of RINalyzer here. For Cytoscape 3.x, you also need to download structureViz. If you have trouble installing RINalyzer, you can read further instructions here. Release 2.0 (June 2014) is verified to work with Cytoscape 3.1.x and UCSF Chimera 1.8.1 (and above). Release 1.3 (November 2011) is verified to work with Cytoscape 2.8.x and UCSF Chimera 1.5.x. Release 1.2 (January 2011) is verified to work with Cytoscape 2.8.0 and the newest version of UCSF Chimera 1.5. Release 1.1 (September 2010) is verified to work with Cytoscape 2.7.0 and UCSF Chimera 1.2, 1.3, 1.4. Release 1.0 (September 2010) is verified to work with Cytoscape 2.6.x and UCSF Chimera 1.2, 1.3, 1.4. RINs can be generated on the fly from a currently open structure in UCSF Chimera using the Chimera built-in methods for contact and hydrogen bond detection. Precomputed RINs generated using the RINerator module as described here can be downloaded from our simple web interface RINdata. The RINerator module can be used to generate specific RINs, for example, including ligands, or in a batch fashion for multiple structures. The RING web server can also be used to generate different types of RINs. If you have any questions, comments, suggestions or criticism, feel free to contact us at: rinalyzer [at] mpi-inf [dot] mpg [dot] de.